Encourages all the students who are working hard and struggling in school and will one day be the FUTURE OF FASHION! Find here some basic information here which will help you excel in your fashion/leather classes.Enjoy your school year and remember~Pelle Valore, Inc. is student friendly and we have off price goods and sell scrap by the pound to help you with your projects! 1. Flexibility--Leather stretches to conform to individual contours, yet retains sufficient shape to provide support. 2. Durability--Leather resists punctures, heat, cold and other stresses sowell that it’s used in many safety applications where other materials fail. 3. Comfort--Leather “breathes” allowing air in and moisture out. A natural insulator, leather protects against extremes in temperature and humidity. 4. Beauty--Leather, by its very nature; comes in a wide range of pleasing textures and surface patterns. It also takes well to variety of finishing processes, design and color applications. A rich “feel” and pleasing scent also heighten the appeal of leather. A misconception about leather is its smell. Yes leather has a pleasant, easy smell. This is NOT to be confused with over processed leather. The MORE IT SMELLS the worse it is! (Corrected Leather—definition to follow). Leather is sold in a “TR” (table run) selection. It is graded just as you are in school. The lower the grade the more work (correction) it needs to bring it up to the higher grades. What you actually smell is the chemical so be very mindful when purchasing. Leather/Suede is a natural material made from the hides of animals. Just as no two animals are exactly alike, no two pieces of leather are identical. In addition to its own genetic heritage, each hide bears the little nicks and scars that marked the animal during its lifetime. 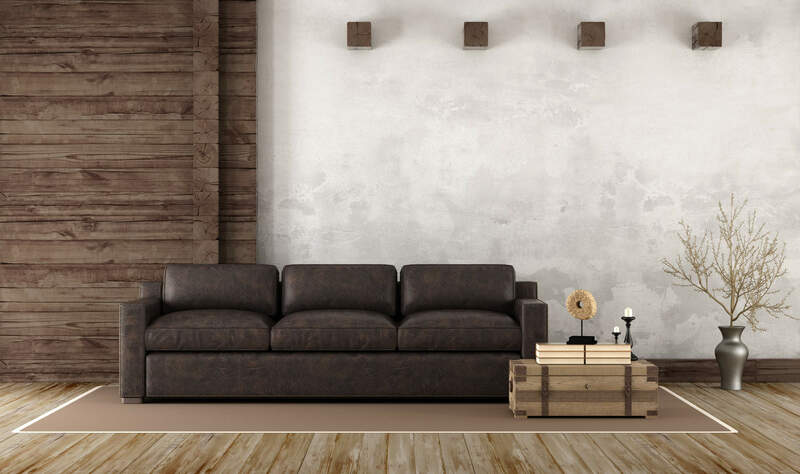 These natural characteristics are NOT defects and are considered marks of distinction in full grain leather, adding to the unique appeal of the individual finished product. When a more uniform appearance is required, however; the leather can be sanded to produce what is called a “CORRECTED GRAIN”. In converting hides to leather, all unessential parts of the original animal hide are removed leaving only the surface “grain” and middle “corium” layers. It is the remarkable structure of this corium-made up of millions of microscopic fibers, twisted and interwoven by nature-that gives leather its high tensile strength and other desirable qualities. Most times the animal is taken for the meat first and the remainder (by-product) is used by our industry. We complete a food chain! In the tanning process the hides are chemically cured to prevent deterioration. The chemicals used in the process also enhance the flexibility of the leather and improve its ability to withstand extremes humidity and temperature. The tanning is followed by another process that restores the natural lubricants lost due to the tanning agents and other chemicals used during the conversion of raw hide into finished leather. One yard of fabric is equivalent to 18 square feet of leather/suede including waste (the under belly and flanks). For example: if you are making a garment and you know that if you were using FABRIC you would need 4 yards then you simply would multiply 4 (fabric) x 18 (leather) and this will give you the amount of leather/ suede needed to make your project (72 square feet of leather). Most all leather/suede is sold by the square foot. Normally not a question you would ask anyone but in leather/suede it is crucial to ask always as all types are different sizes and this well help you so zero in on your consumption. Leather refers to hides that have NOT been sanded, buffed or snuffed as opposed to TOP-GRAIN leather which is corrected (see next definition below). The grain remains allowing the fiber strength and durability. The grain also has breath-ability, resulting in less moisture from prolonged contact. Rather than wearing out, it will develop a patina over time. Full grain leathers are typically available in two finished—aniline and semi-aniline. The second highest quality. It has had the “split” layer separated away, making it thinner and more pliable than full-grain. The surfaced has been sanded and finish coat added to the surface which results in a colder, plastic feel with less breath-ability and will not develop a natural patina. It has a greater resistance to stain. Leather is any leather that has had an artificial grain applied to its surface. The hides used to create corrected leather do not meet the standards for use in crating vegetable-tanned or aniline leather. The imperfections are corrected and sanded off (as if you were fixing a whole in a wall) and an artificial grain impressed into the surface and dressed with stains and dyes. Leather created from the fibrous part of the hide left once the top-grain of the rawhide has been separated from the hide. During the splitting operation, the top-grain and drop split are separated. The split leather is used to create suede. Aniline finished is a type of leather dyed exclusively with soluble dye's without covering the surface with a top coat paint or insoluble pigments. Semi-Aniline have the addition of color pigments applied to the surface followed by a clear finish. Therefore, these leathers are called semi-aniline. After dying and milling, a pigment coat is sprayed or rolled onto the hide surface.